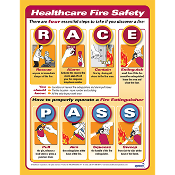 RACE PASS is a fire safety acronym and protocol: Rescue, Alarm, Contain and Extinguish when you first encounter a fire, and Pull, Aim, Squeeze and Sweep when using a fire extinguisher. 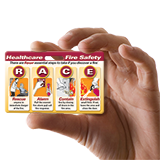 Developed for hospitals and nursing homes, RACE PASS is now used in workplaces worldwide and advocated by fire safety professionals. 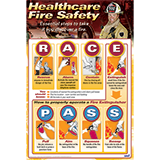 RACE PASS is designed to be simple and safe, easy to recall even in an emergency and promotes maximum safety to the practitioner. Our products feature visually appealing and memorable posters, signs, and I.D. badge cards to ensure your staff take the right course of action during a fire. If you would like to add branding or simply can't find the product that fits your needs, please speak with our customization department: if you can dream it, we can design it! "I am very pleased. Your products are high quality and we receive many compliments on that quality. Thank you."